Susan practices turning a patient to prevent bedsores. If you are caring for a patient with immobility, it is recommended to turn them every two (2) hours to prevent skin breakdown (bed sores). 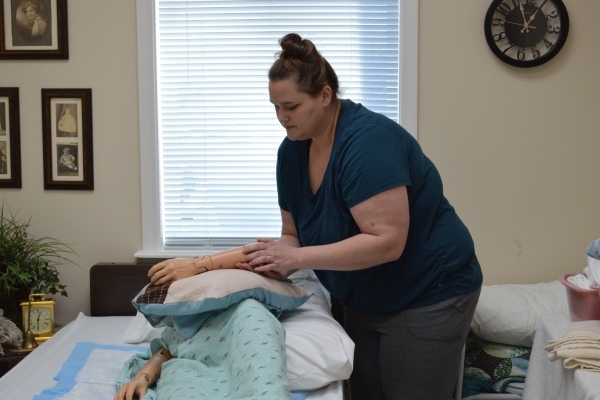 Pictured, our CNA student Susan Campbell is practicing this skill this morning as a part of our 15-day CNA Fast Track class. This class started on January 14 and will be ready to test for their CNA licenses by next week. For more information on our next class, scheduled for Feb. 19- March 12, give us a call at 870-879-1440 or email Charlotte @ CMClausen@uams.edu.